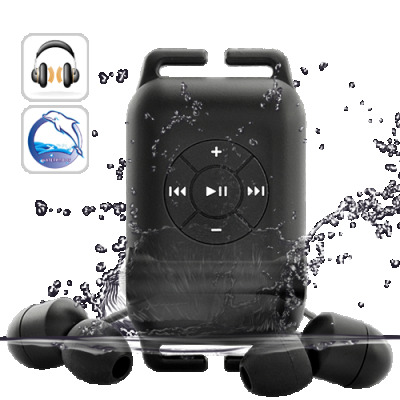 Successfully Added 4GB Sports Waterproof MP3 Player to your Shopping Cart. Enhance your portable audio experience with this Sports Waterproof MP3 Player. This cool gadget is the best way to enjoy music when swimming in the ocean, relaxing by the pool, taking a shower, or even when working out. Best of all, the huge 4GB of memory is great for holding all your favorite tunes. Enjoy clear audio while diving on your adventures under the sea, or just when chilling in your swimming pool. Whether you enjoy Rock, Hi Hop, Pop, or Classical music, you will thoroughly enjoy the clarity and quality of the music provided by this MP3 player. This Sports Waterproof MP3 Player is lightweight and comes with an arm-strap, allowing it to be easily carried with you on your underwater explorations. The in-ear earbuds are designed to fit comfortably inside your ear and utilize a screw-in jack design to ensure a water-tight connection, making this an amazingly convenient audio player for scuba divers and surfers. Get this Sports Waterproof MP3 Player today and enjoy your diving adventure with a beat in every wave. Available in stock today for single and bulk purchases straight from the leaders in factory direct wholesale electronics, Chinavasion. Why It can't be recognized when it is connecting to the computer? The unit must be turned off before it is connected to the computer. Otherwise it freezes and cannot be recognized.